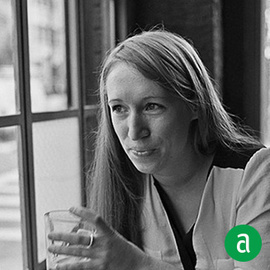 Katie Bell, Project Manager at Manhatta in New York, shares her career timeline and advice for up-and-coming professionals. I learned the hard way that I was meant to work in hospitality after going to school, interning and working in advertising for three years. Though I enjoyed it and learned lessons applicable to a career in restaurants – marketing, social media, and organizational systems – I wasn’t passionate about the work. When I returned to restaurants, I knew this was what I wanted to do. Part of what makes a dining room team special is the diversity of the paths that led them to this industry. Do things correctly. When I began working at Per Se I was driven insane by the perfectionism. Very quickly I learned to love the push for perfection. There is no reason for not doing things the right way. Treat your tools and those around you with respect and always search for a better way to do things with more finess. This joy in efficiency and striving to improve, in general and in the details, is something I keep with me. Early on I learned the importance of treating every guest equally and with respect and interest. I’ve found that the most fascinating guests are not those with security guards or black cards, but often the most unassuming ones. Making connections with guests and helping to create special and memorable experiences are why I love my job. I’ve learned the value of taking care of those in the industry – honoring their hard work and offering the royal treatment to our interns, cooks and commis when they dine out as well as treating staff from other restaurants like family when they dine with us. Above all, Blue Hill has taught me the importance of taking care of your staff. Providing the best service possible requires a staff that is happy, inspired, challenged, and supported. We strive to create a family environment that pushes the staff to excel and continue learning. I spent a part of a summer brewing with Jared Ruben of Goose Island Brewery. More and more, our industry values individuals who have spent time finding out how something gets to the plate or the glass: farming, brewing, wine making, distilling, cheese making. There is so much passion in the people who create what we cook, pour and serve. It is our responsibility (and joy) to be able to share in that passion and pass it along to the guests.